Spring is just around the corner! With Easter on the horizon, I decided to think warm thoughts and decorate for Easter. 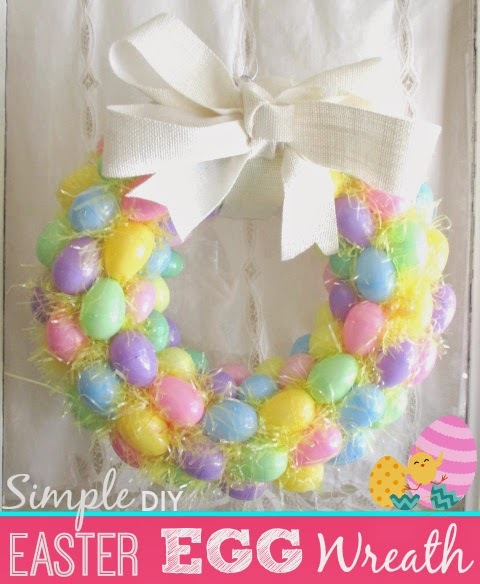 I sat down with a cup of coffee and my glue gun last weekend and put together a simple DIY Easter Egg Wreath. It only took about 30 minutes to make. And the best part (beside the fact that it's super cute)? It only cost about $7 to put together! 2 bags of 46 pastel plastic Easter Eggs(ea.) - we found ours at Walmart for $1.99 a bag. You will have some left over. We chose to leave the orange eggs that are included in the pastel bag out of our wreath however, you can make yours to preference. 2 bags of plastic yellow Easter grass (or another color of your choice). We found ours at A.C. Moore for .69 cents a bag. Optional - 3 yards of ivory burlap ribbon - we found ours at Target in the dollar section. 3 Yards of burlap ribbon for $1, is a great deal! Start by gluing your eggs around the entire outside of your straw wreath form, using your low-temp hot glue. Hold each egg in place as you go, until glue has cooled/set. Continue until the entire front and side of the wreath form is covered. When finished, you will have spaces where the wreath form will still show through. 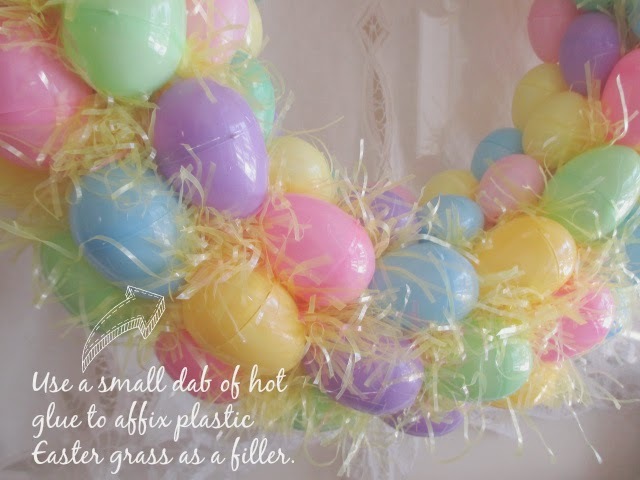 To fill those spaces, simply use a dab of hot glue (directly in the space on the straw wreath form) and a small bundle of the plastic Easter grass to fill these spaces. To work the Easter grass into the smaller spaces, use the wooden skewer to push the Easter grass into the spaces (once the dab of low-temp hot glue is in place). Work your way around the entire wreath form until all of the empty spaces are filled and the wreath form no longer shows through. Trim any excess/stray plastic Easter grass when complete. You can create an optional bow for your wreath using burlap ribbon as pictured, or another ribbon of your choosing. Hang your completed Easter Egg Wreath indoors or in an area that is shielded from the elements, such as a covered porch.